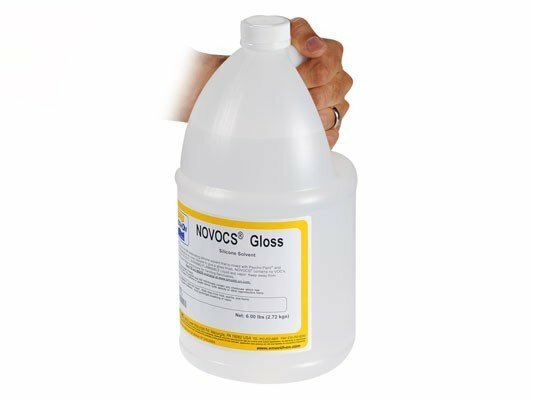 NOVOCS® is a low viscosity silicone solvent that evaporates quickly. NOVOCS® will lower the viscosity of Smooth-On silicone rubbers and contains no VOC’s. NOVOCS® is particularly useful in thinning down Psycho Paint® silicone paint base to apply via brush or airbrush to cured platinum silicone rubber props and prosthetics. NOVOCS® is available in GLOSS and MATTE varieties. 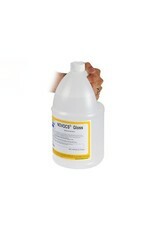 NOVOCS® Gloss will leave a glossy finish on cured silicones. NOVOCS® Matte will leave a matte finish.Materials should be stored and used in a warm environment (73°F / 23°C). This material has a limited shelf life and should be used as soon as possible. Wear safety glasses, long sleeves and rubber gloves to minimize contamination risk. Mix the A and B components of two component silicone sytems before adding NOVOCS™. Add the desired proportion ofNOVOCS™ solvent to create a thinner silicone mixture which can be brushed or airbrushed onto the surface of a cured silicone casting.